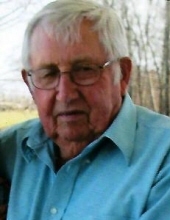 William Justice "Pete" Milby was born in Gabe, KY to the late Mr. Thurman L. Milby and Katherine Judd Milby on July 26, 1935 and departed this world on June 4, 2018. He was holding the hand of his beloved wife of almost 59 years, Mrs. Linda Sue Loyall Milby and his devoted daughter Mrs. Vickie Sue Buckman. Justice spent his life tending to the land God had granted him. He was also a dedicated seasonal employee of Greensburg Tobacco Warehouses, the community of Oak Forest Church, his son Mr. Jeff Milby, as well as a host of extended family. Justice was blessed by his sometimes naughty but very special Grandchildren: Matt Buckman, Hope Marie Devine, Melanie Milby, William Milby, Emily Murrey, as well as a quiver full of great grandchildren and great great-grandchildren. He was honored to serve as an Elder, Clerk, Sunday School Superintendent and participated in a host of other activities for Oak Forest Church. When God said go and serve your fellow man Justice was always the first to step forward and the last to leave. If we could see into Heaven right now I am sure Justice is sitting with Jesus on a pond bank fishing. A tribute to Justice's life will be held Saturday, June 9, at 2 P.M. Central time with visitation beginning at 12:30 Central time at the Oak Forest Cumberland Presbyterian Church in Gabe, Ky.
Justice always said, "The only good plant was a plant you could eat" so we request no flowers. Please make a donation to the N.C. Milby Cemetery at the church or the Cowherd & Parrott Funeral Home. To plant a tree in memory of William Justice "Pete" Milby, please visit our Tribute Store. "Email Address" would like to share the life celebration of William Justice "Pete" Milby. Click on the "link" to go to share a favorite memory or leave a condolence message for the family.